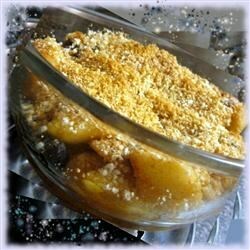 "Warm peaches topped with vanilla wafer crumbs, and baked in dreamy sugar and cinnamon mixture. A quick and easy favorite dessert!" Place peaches hollow side up in a pie pan. In a medium bowl, mix together crushed vanilla wafers, brown sugar, butter and cinnamon until crumbly. Sprinkle over peaches. Great recipe, and super easy! The vanilla wafers are a great idea. I used fresh sliced peaches instead and it was really tasty. This was very easy and tasted good. Changes I made-I doubled the amount of peaches and tripled the topping and used an 8x8 pan.